E-commerce or Electronic Commerce is a modern way of business. Transaction in case of buying or selling a product or service through electronic devices and internet connection is E-commerce. 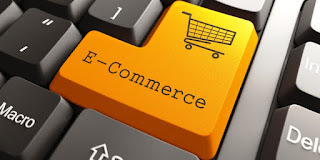 In E-commerce, the buyer and seller can not only communicate with each other but also the buyer can pay and the seller can receive payments through internet connection which can be called electronic payment service. So in E-commerce, a product travels to buyer from seller or a service is served to it's buyer without the need for the buyer to meet the seller by appearing physically. Again, in E-commerce, the seller receives payment for his/her sale without meeting the buyer physically. E-commerce is a virtual market place which can be accessed online through devices like computer and cell phones. Thus an E-commerce market place can be accessed from anywhere where internet connection is available. Buyer can visit these online market places and can order product and service and then can pay the payment online. A seller through E-commerce can reach thousand times more customers than that s/he can reach through a physical shop. As the product or service can be accessed from anywhere, the reach of the business is big and thus the business becomes big too. E-commerce maintain a single set of international standards, which is the universal standard. This is followed everywhere. In E-commerce marketplace the seller can present his/her product or service with a various kind of representations beside text descriptions like audio, video, 3D animation, changeable colors etc. The buyer can check the product or service for as long as s/he wants which is another very good thing to get convinced. In this technology, buyer and seller can communicate over the internet through chats, comments, forums alongside calls over telephones. E-commerce facilitates rich information available for the buyer before and after buying product and service. Providing and receiving these information are less costly and of better quality. E-commerce enables personalization. Sellers can select individual or group of individuals to sell their products or services. On the other hand, buyers can also ignore buyers they don't want to shop from. This saves time.